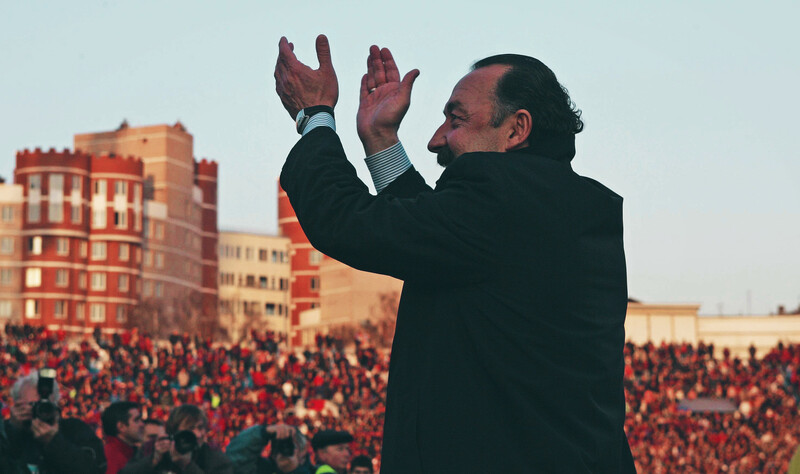 As Valeriy Gazzaev glances over at the concrete pitch, a nostalgic grin spreads across his face. The goalposts are rusting, the nets are long gone and the surrounding wall is crumbling and decorated with graffiti, but there is a moment that makes all that irrelevant. A small child, no older than five, breaks clear from his friends and drills a shot at goal, but his effort is blocked by the goalkeeper, who is at least 10 years older and twice the size. Not deterred by the short-term failure, the child races across to collect the ball and try again. The players on show today will almost certainly never turn out for a professional team, but their pure burning desire to play and entertain is something Gazzaev can relate to. As a boy, he verged on the fanatical approach to the sport as many youngsters did, sometimes crossing the line between passion and recklessness. The lengths Valeriy would go to just to get a game were matched by the fans that flocked to watch him early in his career, and would be mirrored by his fierce determination as a professional player and as a manager. As a 17-year-old he broke into the first team at his hometown club Spartak Ordzhonikidze as a slight but electric forward. At the time, Dinamo Stadium was rammed to the rafters, almost literally as some fans chambered up trees or hung off telegraph poles just to catch a glimpse of their side and its youngest star. He was not a thoroughbred goalscorer, but was a tough entertainer who was hell-bent on winning, and winning well. In fact his scoring record was relatively poor; just 38 league goals in his first eight senior seasons before his move to Dinamo Moscow at 25, and even then he only managed just over a goal every three games. His effect on the team was infinitely more than statistics on a page, however – it was his infectious aura and spirit that grabbed the attention of supporters and team-mates alike. For a man who stood a mere five foot eight inches tall, he stood his ground in the face of physical intimidation. Not for the last time, it seemed as though his pure brute force of will had spawned into success. A move to Moscow to join Soviet Top League side Lokomotiv for whom he represented for three years resulted from the inevitable attention. There he played alongside one of the club’s greatest managers, Yuriy Semin, who was also a forward by trade. Like Gazzaev, he was not a prolific scorer, but he could appreciate the value his younger team-mate could bring to the side. To gain recognition in the capital while playing for a provincial side in the Soviet second tier was quite some achievement, and one Gazzaev would surpass when he returned as manager almost two decades later. Perhaps his genius lay in something simpler than inspiration. In the early 1990s, Spartak Moscow were the only club to truly keep their heads above the water as post-perestroika football became a jungle of disaster and corruption. 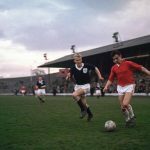 They were in the fortunate position of being the strongest and most popular side, which allowed them to grab the slice of financial reward for European qualification as well as attract the best players from across the former Soviet Union. To break this monopoly, presided over by the inspirational Oleg Romantsev, was therefore nigh on impossible by attempting to compete financially or in the transfer market. In short, it needed an Iron Fist – and Gazzaev certainly had one of those. One of his former players once commented on the more forceful side of the manager’s approach: “He used to be really angry. It used to be really difficult to talk to him, and we were terrified to look him in the eye.” It would be too simple to paint his demeanour as outright aggression, however. 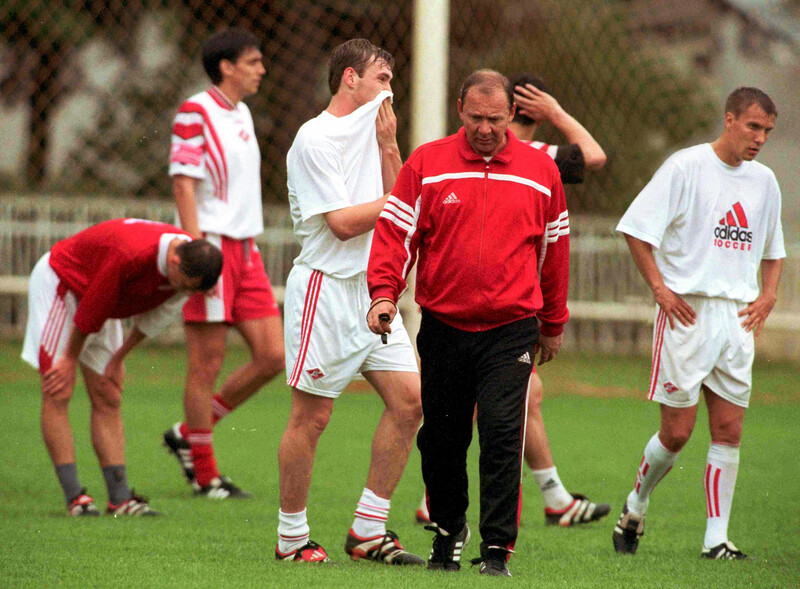 In the championship run-in before FC Alania’s 1995 title win – during which Gazzaev was manager – cameras were allowed into the changing room before a crucial match to record the half-time team talk. Alania’s players were still catching their breath after an energy-sapping first half battle, but when Gazzaev raised his voice a notch to drive home his message, every eye in the room was fixed on their leader. Not one trembled in fear of the brute force of his anger – not that he was incapable of unleashing his fury – as he spoke. Instead, their attention had been earned, nurtured and steadily built up through his relationship with them. This connection was crucial, especially for a character like Vágner Love, who was famous during his time in Russia for learning next to no Russian. At the civic reception to mark CSKA’s European triumph, he avoided eye contact and simply mumbled “Ne ponyimayu” – ‘I don’t understand’ – whenever he was asked a question. That he went on to become the club’s third highest league goalscorer of all time and be voted the greatest foreigner to represent the club, scoring 101 goals in eight years as a CSKA player, speaks volumes for Gazzaev’s ability to manage the person as a well as the player. Gazzaev was born in what was then known as Ordzhonikidze (now Vladikavkaz), the capital of North Ossetia, just 20 kilometres from Beslan, the scene of the horrific school massacre where Chechen rebels claimed the lives of at least 330 victims. The region borders South Ossetia, which saw bloody fighting during the South Ossetia War and Russo-Georgian War either side of the turn of the century. Even the original ancestors of Ossetians, the Alans (from where the region’s historical name, and in turn the new name adopted by Gazzaev’s football club – Alania – is taken) were a bellicose tribe, despite their nomadic migration through Southern Europe two millennia ago. Although he lead Alania to the domestic championship in 1995, he was unable to drive them further on the continental stage; what he needed was a grander platform, and the wildly ambitious and wealthy Evgeniy Giner provided it. After a poor second spell as manager of his former club Dinamo ended in 2001, Gazzaev was beckoned by Giner to take charge of CSKA Moscow. When he arrived, there were a number of hugely promising youngsters coming through the ranks, most notably Igor Akinfeev and the Berezutskiy twins, Vasiliy and Alexey, who grew up on a diet drenched in Gazzaev’s brand of passionate authority. Still only a teenager, he had already been entrusted with the goalkeeper’s position for two years, and has since gone on to break the record for clean sheets kept in Russian football. The first decade or so of the newly-formed Russian Premier League saw a huge influx of foreign stars from Africa and South America with dubious ambitions or qualities, but Gazzaev dealt sensibly, bringing in more of the best Russian talent as well as genuine quality ‘legionaires’ such as Daniel Carvalho and Love. While the latter cemented his legendary status at the club with a deeper impact at the club, Carvalho was sublime in the glorious European run to the 2005 final. Their ability to adapt into the uncompromising and alien world of Russian football was significantly down to Gazzaev’s intrinsic love for the game, and his nous at judging a player’s potential value to the team. The euphoria at having conquered the continent was felt not just in Moscow but throughout the country. Since becoming separated from the former Soviet Republics, the standard of Russia’s performances at club and international level had suffered, while fans were downtrodden at the alarming slide of the quality of their stars. Perhaps it would be more accurate to describe the frustration as a form of envy; finally Western Europe was no longer a closed, relatively unknown arena, but whereas before the great Soviet players and teams had commanded respect on a global scale, now they were third class citizens in a first class competition. Even Gazzaev’s Spartak-Alania Vladikavkaz champions had been humiliated 7-2 at home against Rangers in the first round of the 1996 Champions League a decade earlier. This is a man who knows a fair bit about overcoming seemingly insurmountable odds. His kind expression and bushy moustache belie his experience in the game that saw him guide Spartak-Alania to multiple European campaigns in the 1990s, however unsuccessful they turned out. This golden era, capped off by the stunning Russian Premier League title win in 1995 that disrupted the phenomenal inertia of Romantsev’s Spartak Moscow machine, was magical because of the odds against it, rather than its pure quality. His appearance has barely changed in the last 20 years, unlike many of his contemporaries. In much the same way that Vicente del Bosque commands respect through his actions but retains a seemingly almost paternal warmth, Gazzaev has not withered with the years. From an early age he wore a suit and tie without question when representing club or country in public, but on the training pitch he was in the thick of every exercise with a verve not often seen from modern managers. His enthusiasm for the game, be it a children’s kickabout with a scruffy ball on concrete or bellowing instructions and encouragement to his players in a European final, has always been infectious. Perhaps his most lasting legacy, however, will not be in past glories with Dinamo, Alania and CSKA, but in his vision for the future. One glance at a map of Russia presents the most obvious and awkward problem of the league structure – it spans an incredible distance. In the second tier, the furthest distance a team can travel is actually longer than the length of mainland Asia; Baltika, based in the coastal enclave of Kaliningrad surrounded by Poland, have to traverse seven time zones and 7,500 kilometres just to reach Luch Energiya at the very end of the Transaction Siberian Railway in Vladivostok. Teams at this level struggle to survive financially, especially when faced with cancelled matches due to poor weather. 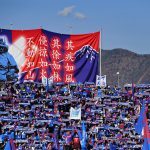 Since 2003, at least one club has either voluntarily relegated themselves or has gone out of business altogether due to the heavy burden, which is hardly surprising when one considers that the average total operating budget of a second tier club, including all salaries, travel expenses and transfer fees, is about $3 million. This strongly suggests that the number of professional clubs is excessive, which is where Gazzaev comes in. Since leaving his post as President of his alma mater Alania Vladikavkaz, which itself folded and reformed in the third tier, Gazzaev has been a prominent voice in proposing radical changes to the entire structure of Russian football. At present, the Premier League hosts 16 teams, with the second-tier FNL comprising 20 sides, and the vast five-division Professional Football League has around 64 clubs – a number which varies year on year depending on the survival of clubs at the very bottom. Each tier has a separate governing body, which in itself is a messy system, but what Gazzaev has suggested is cutting the total number of professional clubs to 54 by expanding the Premier League to 18 teams, and regionalising the currently national FNL into three divisions of 12. 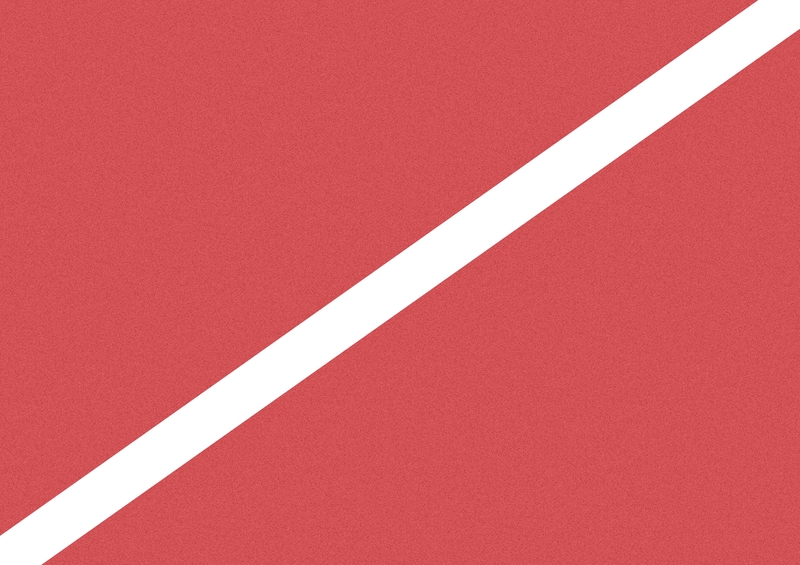 It is a sound proposal as it would significantly reduce the costs of travelling such crazy distances – imagine Brentford having to fly to Bolivia for regular league matches every year, and you get the picture – while offering greater incentive for teams to become more financially self-sufficient and stable before turning pro. Still only 61, Gazzaev has filled his career with enough drama and glory to last a lifetime, and could still have the greatest impact of all by playing a role in ensuring the health of the sport he loves. He is by no means the all-knowing wise man of Russian football – he also put forward a plan to create a Ukrainian-Russian Superleague, which was never likely to take off – but with his insatiable appetite for success, it would be a brave man to bet against him winning one last time.